Willow, taken back in October, 2015. 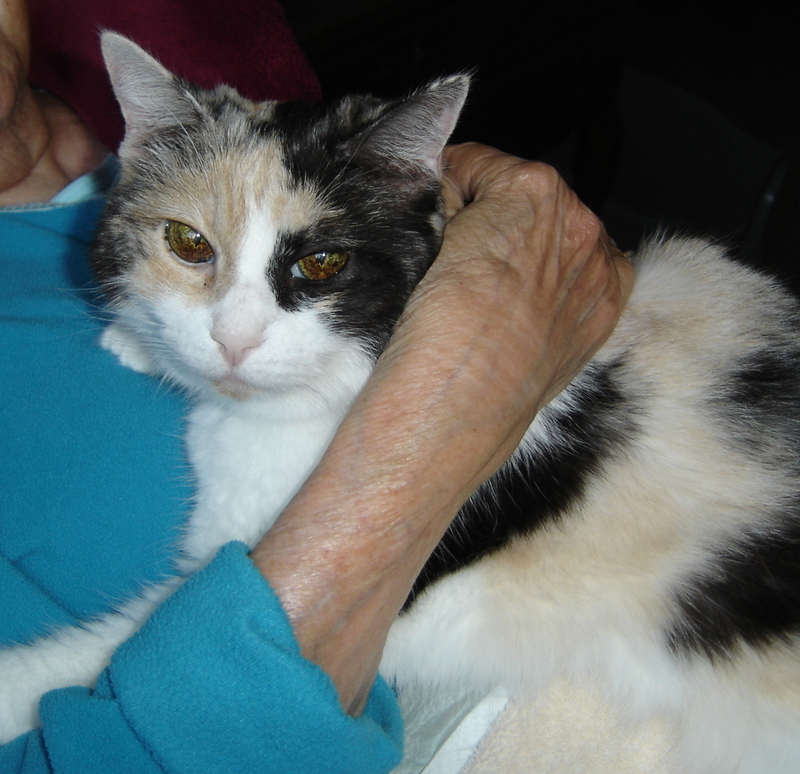 One can see the love between these two elder ladies, one human, one feline. Rick’s mother, holding her here in this photo, passed away in December, 2015. Willow has now joined her elderly companion. There comes a time when the body is too worn and tired to continue, and the spirit longs for freedom from it. 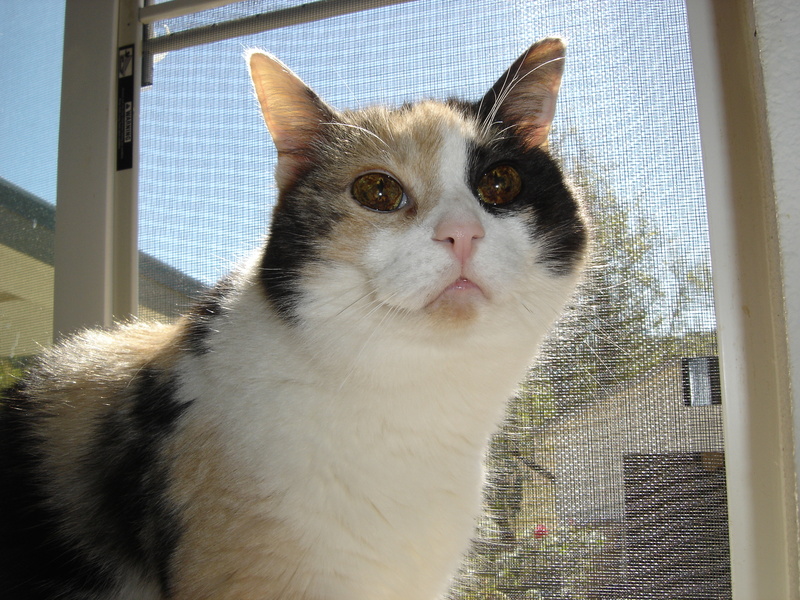 Willow, by all reckoning 22 years old, had been losing ground to extreme old age and failing kidneys. 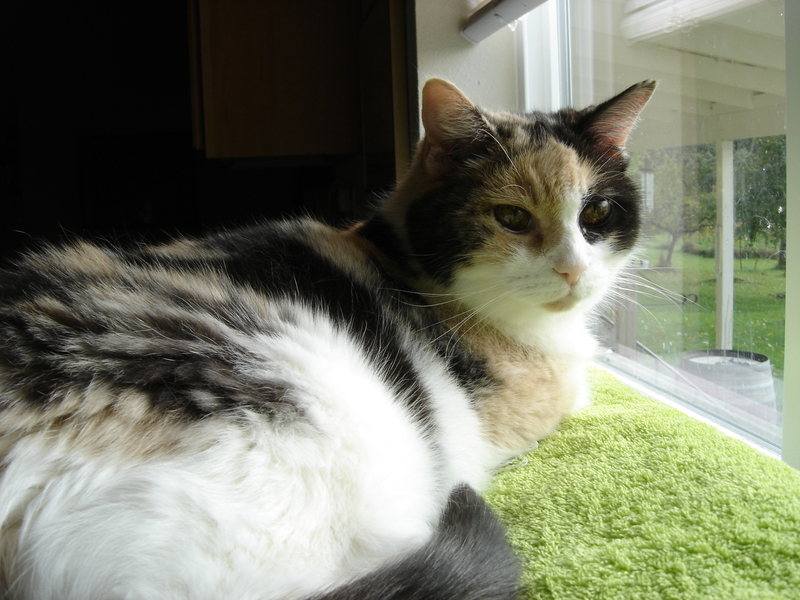 The intervals between her trips to her veterinarian had become shorter and shorter this year, and she had been placed on subcutaneous fluids for hydration these last few weeks. There came the dreaded but expected morning when she made it known that it was time to assist her departure from this life, with all the infirmities of her age and chronic illness. 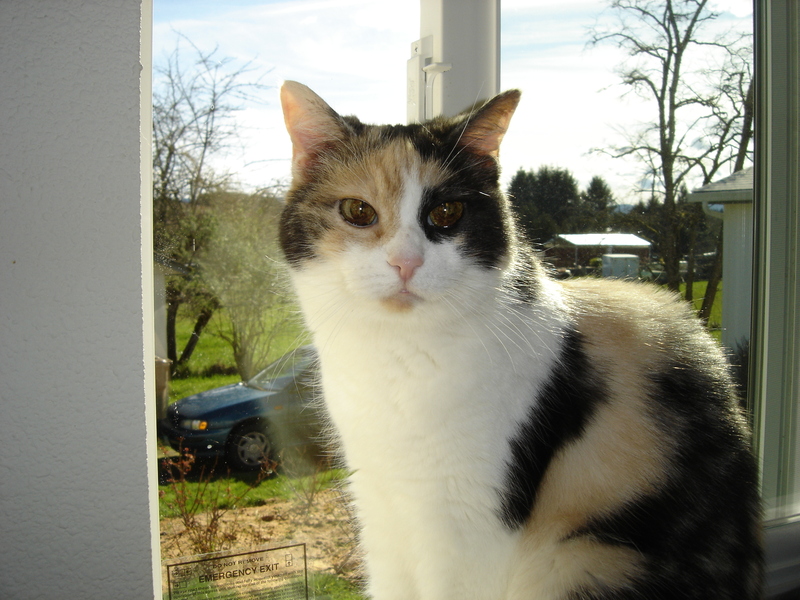 She went for her last ride to her veterinarian that afternoon. We are extremely grateful to River’s Edge Pet Medical Center for their compassion and support. 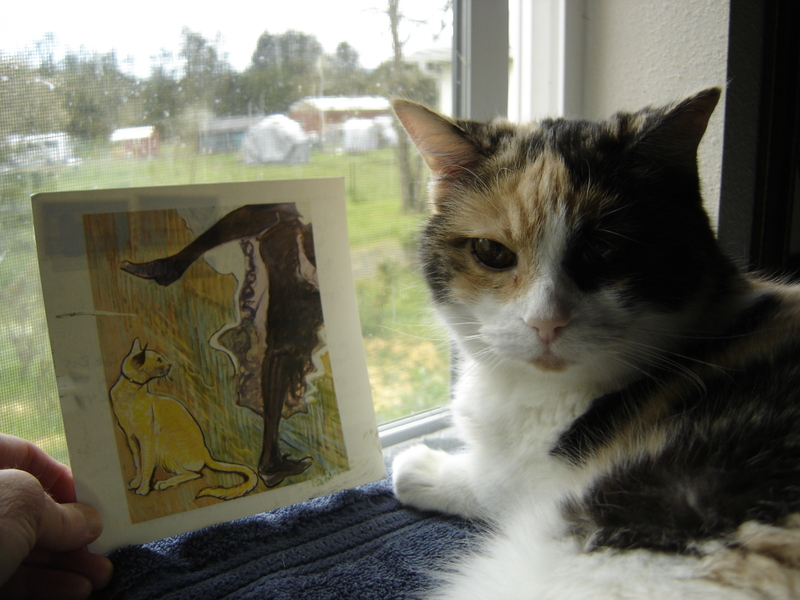 Willow, in younger days, reading a card from her friends, Doug (human), Andy and Dougy (cats) over at Weggie Boy’s Blog, https://phainopepla95.com/ Doug has Wegener’s granulomatosis- now called GPA- that attacks the small and medium-sized blood vessels in the body, and is on dialysis due to kidney failure. Willow was laid to rest the following morning at sunrise, on the farm she loved so well, facing the eastern light. It is here I will close my own thoughts, and leave readers with an eloquent note I received from an old friend and long-time mentor, back in 2015 when Rick’s mother passed away. We had cared for his mother in our home for over three years, until her body finally gave in to the infirmities of old age. 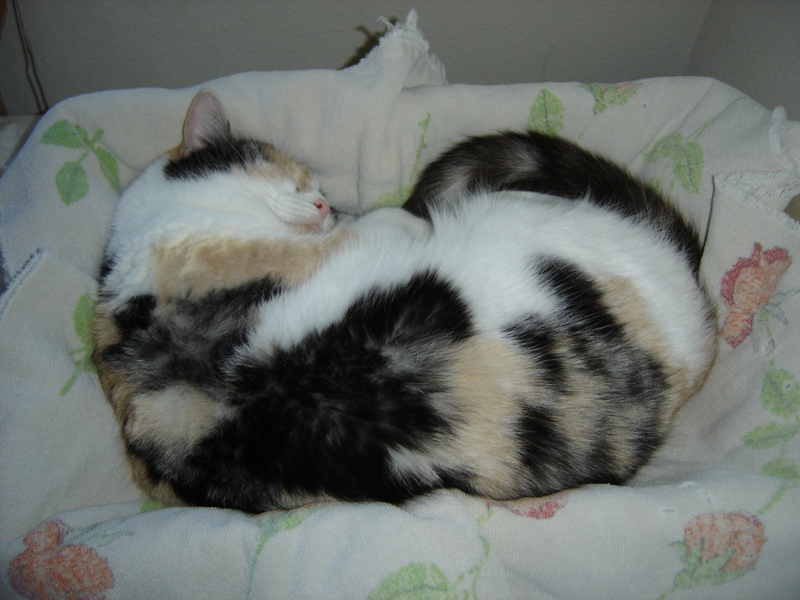 Willow, her elderly companion cat, was there with her when she died. This note from our friend still brings us great comfort. “I join you in your sorrow and joy. I am aware that getting old is mostly a matter of letting things go, giving up many thoughts and dreams that we compile during our lives. I have come to believe a page from the Buddhist philosophy, dependency arising. All things are connected to all things. Nothing happens without a ripple through the universe whether we are able to perceive it or not. 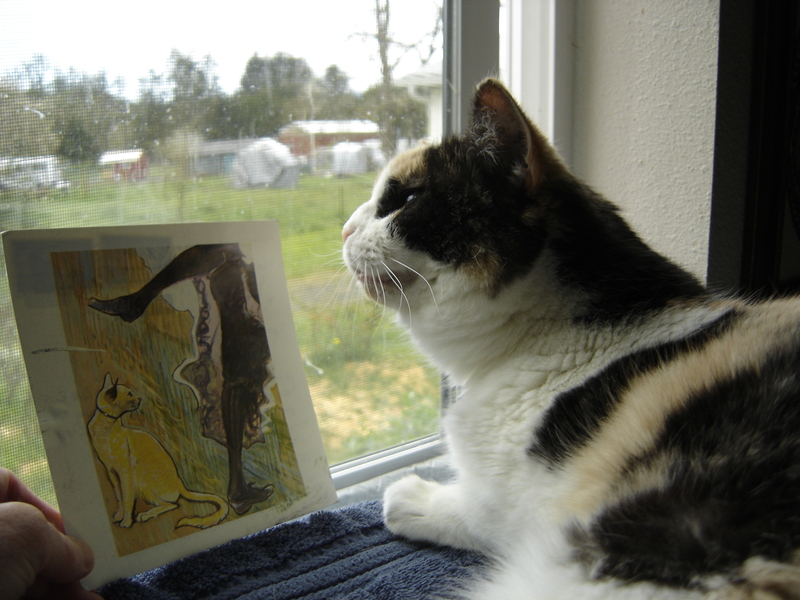 I also believe it has been a blessing that she was surrounded by the cats and the farm, all the things that speak of life with their cycles and acceptance of all that happens. A few days ago I had a five minute stare down with a four point buck and several does. He was a little curious but very separate with his little family. He was also fearless and accepting of our sharing a space and time. Eventually he went back to eating and I went along my way. The does weren’t concerned in the slightest. There’s nothing special in that five minutes except that we are all here, we all have our part to play and then we go forward to whatever dimension is next. The rest of us remain with our memories, selecting out the good and mostly letting the rest fade away. While I’m in no hurry, to me Death is a friend whom I’ll have plenty of time to get to know in the future. I’m watching the seasons come and go with more intensity than ever before. 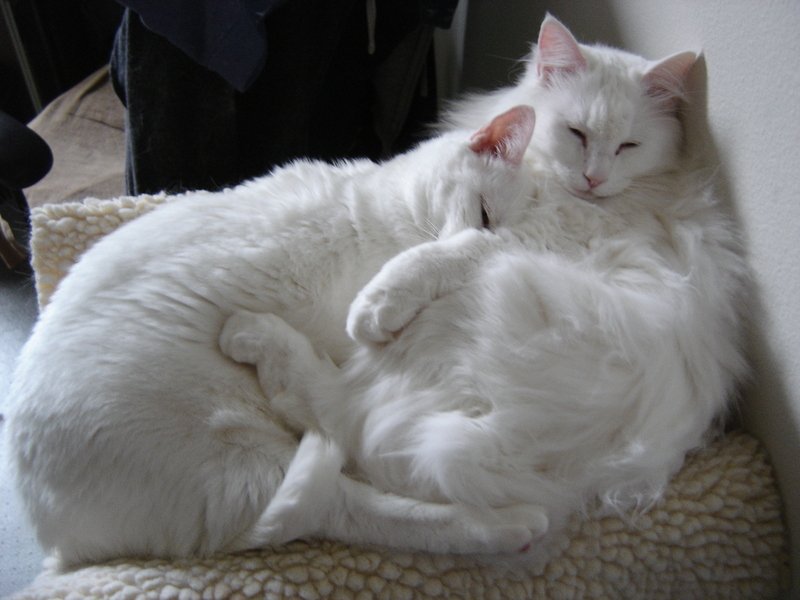 Blynken (left) and Wynken (right), enjoying a good snuggle. Cherish the ones you love. The time passes all too quickly.